In this article I will attempt to explain how paintless dent repair works and why you need to know about it. We will also go over the different techniques and technology of the hail repair industry. When your car, van or truck becomes a victum of a ding or dent where shoudl you turn? Do you call your local body shop? Do you call your local, reputable PDR technician or do you can a dent repair company? Should I call a body shop? This really depends on the severity of the damage. If you were part of a minor collision where the paint was not disturbed or just lightly disturbed then your best bet is to avoid the body shop like the plague. Should I Call A PDR Technician? There are many solo paintless dent repair technicians out there that can easily be found by doing a local search on your google map. Many of these smaller shops will have 1 or 2 technicians so they are usually booked up and you need to schedule in advance. Should I Call a Local Dent Shop? This is probably your best bet as most these shops have a lot vested in their name and they will have multiple professional technicians at one time. They can normally get you in pretty quick and the repair will not be beat by any other stand alone tech. 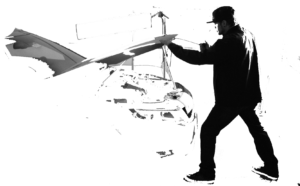 Paintless dent removal has been growing and growing in popularity and is a highly desired career choice for many that attempt to master the art. Because of the growing popularity and the amount of people willing to do less than good work, this industry has become somewhat saturated by bad PDR techs that simply just don’t get the concepts and will cause more harm to your vehicle than good. This has become such a growing problem that when I talk to someone on the phone and they have a severe dent one of my first questions is: “has any other PDR technician already worked on it?” If the answer is yes I normally tell the potential customer that the cost will be to fix their mistakes and to repair the actual dent. Many times these repairs cost 2 to 3 times more because the work is much more extensive. In many cases we can’t even help as the damage done by these makeshift dent guys has ruined the panel and will need to be painted or worse, replaced. DentPass has been in the underground paintless dent repair scene and has made the technique popular among many professionals that have gone and created very worth while companies since in the early 1990s. The traditional way to fix dents for the last 100 years or so is to fill the panel with a hardening agent called bondo. This stuff is much like drywall mud you put on your traditional home building. They fill the dents with this stuff and sand it down to the original contour of the body. The contour is never really the same again as it would take a master muder to get it just right, so no matter what the results were never perfect. In a traditional dent repair shop this whole step is averted by slowing massaging the dent from the back side. Basically the technician pushes the metal back to it’s original shape. Point by point the tech slowly massages the dent little by little. When he needs to bring the dent back down a little at a time they use a technique called knocking down which consists of taping point by point from the top side of the dent. Basically it’s impossible to remove a dent without turning into a mound and then meticulously taping it down to a perfectly flat state. Tapping does not harm the finish or paint in any way if done right and by a professional with enough experience. So while the conventional method of auto body fills the dents in with paint or body filler, paintless dent repair actualy completely removes the dent all together and what you are left with is slightly stronger metal than you had before. Here we have a fast time lapse of a repair done by a technician only showing the pricipal here. We in no way endorse the company that made the video. With Paintless Dent Removal, there are no fillers and there is no sanding. PDR is an environmentally friendly repair method that restores your vehicle’s body to factory-like condition in a fraction of the time at a fraction of the cost. PDR can be used to remove dings and dents from vehicles, as well as body creases and hail damage. Each day, dozens of DentPass technicians across the country safely remove dents with paintless dent repair services. They restore vehicles to their original factory condition without compromising a vehicle’s original painted finish, or a consumer’s wallet. 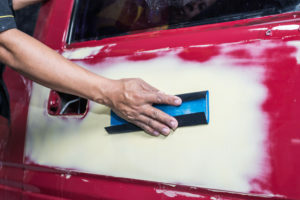 Read on to learn how Dent Wizard’s paintless dent removal process, which we pioneered more than 32 years ago, works to restore vehicles to their pre-damage condition. The R&I technician is like the symbiotic element to the PDR technician as he more than likely requires to access the back side of the dent to be able to push it out, which is done by carefully removing body panels, tail lights, or in some cases, interior panels. To perform PDR. The better the access and the more angles the technician has to the dent, the better the outcome. Once there is sufficinet access to the dent then it is up the PDR tech to determine how he will go about repairing the damage. This is a matriculate process as one mistake can cause hours of work. The second step to any repair process is to assess the damage. Where is the dent? How big is the dent? How do we get to the dent? After assessing the damage, and determining it can be effectively removed through PDR (as 80-90% of all dents are), we prepare the area around the dent for the repair. Paintless dent repair technicians use a special light that is made with hundreds of high power LED’s and then they use a light diffuser to disperse the lighting over the rectangle needed alowing for maximum visibility. The lights give the technician a better look at the offending dent from their point-of-view. The board displays a shadow of the dent, telling us where to precisely place tools on the back end of the dent to massage the body back to its original condition. Special tools are utilized to carefully massage the exterior back to its original position. pixel by pixel the dent technician pushes the center of the dent over, and over, and over; until the dent magically but painstakingly goes away. Normally the paintless dent repair process take about a day but with more severe dents or heavy hit hail damage the process can take several days up to about a week or more. Depending on a dent’s severity it can be done while you wait in the lobby and the results are amazing. Its easy to think they used some type of trick to remove the dent but there is no tricks. Just old fashioned hard work and you have to be an artist with a knack for metallurgy. We strive to always be ahead of the curve when it comes to innovation. That is why we have never stopped learning and schooling ourselves. We are always on the look out for new innovations and techniques that might make us just a little better. Our tools are state of the art too and we buy multiple cutting edge tools every single year. The most common practical use for PDR is the repair of hail damage, door dings, minor creases, large dents and bodylines damage. It is also used for minor collision damage and some heavy collision as a starting point to conventional repairs. The techniques have come a long way since the 80’s and has become the most preferred method of repair for any ding or dent that will allow. The method can also be utilized to prepare a damaged panel for repainting by minimizing the use of body filler. This technique is currently known as “push to paint” or “push for paint”. The push to paint method can be the best thing that ever happened to the body shop industry. This “push to paint” allows the body shop to move more metal so that the filler does not have to be so thick. This reduces waste but more importantly it makes it to where the repair can last for decades instead of just years. See when the layers or bondo become so think it also becomes very brittle and will break over time. If you have something more than 1/4″ of bondo you will surely see the cracks in just 2-4 years of being out in the elements. This can prove to be very costly as the whole repair will have to be done all over again and will result in the same price tag as before. The lighting systems have improved drastically allowing the PDR technician to work outside with no issue of over glare from the sun as the high power lights can overpower daylight. Limiting factors for a successful repair using PDR include the flexibility of the paint (most of today’s refined automotive paint finishes allow for successful PDR) and the extent to which the metal has been stretched by the damage, which depends on the thickness of the metal, the curvature or flatness where the damage occurred and the intensity of the impact. Generally speaking, the shallower the dent, the greater the likelihood of paintless dent repair being a suitable option. Even dents several inches in diameter can be repaired by this method as long as the metal and paint are not stretched. Most experienced technicians can repair a shallow large dent or crease to an acceptable level, but very sharp dents and creases may not be suitable for PDR. The history in Wikipedia is liminted so we will add to it soon. We have been in contact with many of the pioneers to this technique and have been working on a concise history of PDR. Look for it very soon but for now here is fine article from wikipedia that has proven to be a good read. Paintless dent removal was invented around the 1930s at car assembly plants, and has been popularized much later. 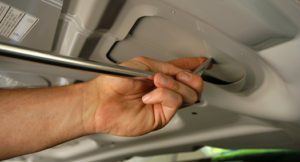 The most common PDR techniques utilize metal rods and body picks to push out the dents from the underside of the body panel. Glue and specially designed tabs may be used to pull out the dents from the outside of the panel. Fine tuning the repair often involves tapping down the repair to remove small high spots. Quality technicians can blend high spots to match the texture of the paint called orange peel. Pushing too hard can create high spots that cause the clear coat to split or crack. Experienced technicians can avoid cracking or chipping with the use of heat, although a re-painted surface most likely will crack. When damage is so great that body filler is necessary, a PDR technician may “push to paint”, resolving most of the damage before minor filling, sanding, and painting, thereby saving time and cost. 2 Comments on "What is PDR?" A paintless dent repair seems so cool! I just got in a car accident this weekend and my car is dented. I wonder if I could have this done to it? But the damage is pretty severe so maybe not. You can take a picture of the damage and text it to (720) 523-3368 or you can shoot us an email.